St Joesph's Boys' School past pupils, Martin McCann (first team coach), David Parkhouse, Ciaron Harkin and Declan Devine (manager). PROUDLY on display on the wall of Derry City manager, Declan Devine’s office in Brandywell Stadium hangs a framed photograph which acts as a hat-tip to his alma mater. In it stands Devine alongside his first team coach, Marty Devine and current senior players David Parkhouse and Ciaron Harkin who are all former students from St. Joseph’s Boys’ School in Creggan. All four will be inducted into the school’s newly established Hall of Fame in recognition of its past pupils’ achievements. And the photograph, which sits behind Devine’s desk, is emblematic of the values and traditions of the school - the very qualities the City boss is attempting to replicate in his squad. Since he’s taken over the managerial reins for a second spell, Devine has been vocal on his desire to bring an identity back to the club and to re-engage with the community and he’s certainly making great strides to that particular end. In fact, he was back on his old turf in Westway last Thursday as part ‘Health Week’ alongside McCann, Parkhouse and Harkin - the latest effort to ‘give something back’ and strengthen the relationship between the club and the school. And the Fanad Drive native is ‘extremely proud’ of the city he hails from which was evidenced in his pre-season tour of the City Walls with his backroom team and playing staff. He was brought up on the streets of Creggan, educated at Holy Child Primary School where PE teacher, Paddy Heraghty gave him his chance in goals and when continuing his education at St. Joseph’s, where his love of football was harnessed by his former teacher, Frankie McGuigan, who convinced Devine to pull on his goalkeeping gloves again, leading ultimately to a move to Ipswich Town as a 15 years-old. Declan has never forgotten his formative years and, indeed, the influence St. Joe’s had on him. “It’s something I’m proud of. I’m extremely proud of my past,” he said when I questioned him about his connection with the school. “I’m very proud of my family and the area i n which I was brought up. I think Creggan, in the ‘80s and ‘90s and going to St Joe’s, was such a big part of my life. I made so many friends who are still friends and the values I was taught at school have remained with me. St.Joe’s teacher, Mr Graeme Doherty, who has organised the Hall of Fame in conjunction with the Past Pupils’ Union, explained how Devine has been a huge supporter of the school over the years. “It was clear when Declan arrived at St. Joseph’s that he was going to be a fixture in the school’s sports teams,” he claimed. “He excelled in his position and was rewarded when he represented the school as a Northern Ireland schoolboy international in 1989 along with his school friends Dermot Hillen, Peter Anderson and Colum Cassidy. “Declan has been a big supporter of the school over the years coming in to deliver training sessions to school teams and give inspiring talks to the boys. Former Derry City players including treble winner, Paul Carlyle, Eddie McCallion, Eamon Doherty, Darren Kelly, Joe Harkin, Floyd Gilmour, James Quigley, John McGarvey, Owen Morrison, Eugene Ferry, David McDaid and Nathan Boyle are also among the many past pupils of the school which gives a glimpse of the talent which has passed through its doors. And the late, former vice principal of the Westway school, Michael Quigley, also represented Derry City Football Club in the past which deepens the connection. 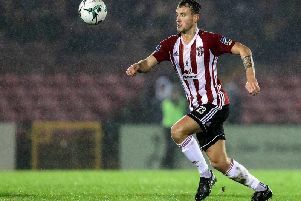 “When it comes to St Joseph’s it’s a fantastic school and I think it’s evolved over the years and has turned into a real, first class establishment for educating Derry lads,” added Devine. Ireland and Brighton defender, Shane Duffy is another product of St. Joe’s and perhaps even one of the current crop of U12 footballers who have progressed to the N.Ireland Cup semi-finals this year can be the next emerging star. Creggan itself is very much part of the fabric of Derry City and has left its footprint on the club. The estate is well represented in this current Derry squad with assistant boss, Kevin Deery and left-back, Patrick McClean all hailing from the estate. Past players too including ex-City skipper, Gerard Doherty, current Ireland and Stoke City winger, James McClean, Terry Harkin, Paddy McLaughlin and of course former manager and centre half and current director, Tony O’Doherty while ex-Leicester City man, John O’Neill had a short sojourn on the club’s board of directors. Brandywell, of course, and so many other areas of the city have supplied their fair share of gems for the club down the years but current boss, Devine is especially proud of his own Creggan roots. No doubt St Joseph’s Boys’ is proud of Devine and its past pupils at Derry City Football Club who act as human billboards for the school and the Creggan area in general.